We are grateful for the translation work of Yumiko Miyazaki which has enabled us to publish two new books of the Most Venerable Nichidatsu Fujii [Guruji] in the last few years. It is our sincere and ardent wish to bring Guruji's compassionate teachings to a broader audience in the interest of world peace. 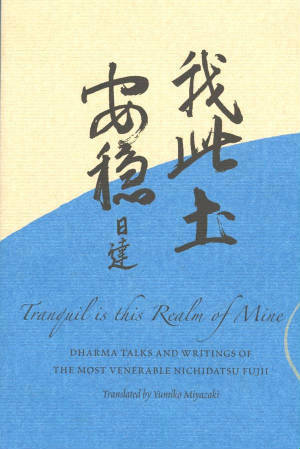 Tranquil Is This Realm of Mine is a collection of Dharma teachings and writings of the Most Venerable Nichidatsu Fujii, translated from the Japanese. This collection is mostly excerpts from longer writings, compiled to serve as a guide to the practice of Nipponzan Myohoji and to help the newly initiated to understand Nipponzan's mission and the reasons behind the practice. It brings Guruji's penetrating insight on many topics including nonviolence, faith, service to others, war, materialism and his diamond-like, unshakable belief in the path to world peace through drumming and chanting Na Mu Myo Ho Ren Ge Kyo. Single copy of Tranquil Is This Realm of Mine: $19.95, includes shipping. 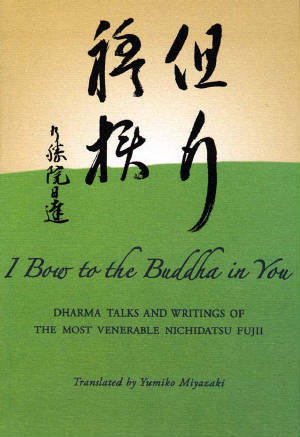 Single copy of I Bow To the Buddha in You: $19.95, includes shipping. Purchase both books for $30 including shipping. I Bow to the Buddha in You is a loose translation of tangyo-raihai, the single-minded, dedicated practice of bowing in veneration to the Buddha in others. The Most Venerable Nichidatsu Fujii, founder of Nipponzan Myohoji and the author of these books, spoke often of tangyo-raihai as a profound truth and the very essence of world peace, and that without tangyo-raihai, peace of any kind was unattainable. In this original collection and translation, tangyo-raihai is the central theme on which Guruji expounds as the sole practice to break the endless, downward spiral of violence in this age.